A cupcake stand, also called a cupcake tower or a cupcake tree, is a creative, interesting way to present a collection of cupcakes for a party or special event. Stands are especially useful at occasions such as weddings, when lots of guests are present and a good appearance is important. Though there are several varieties on the market, all of them are designed to hold and display a certain number of cupcakes (usually at least 20) in a compact and decorative way. There are two main types of cupcake stands. A basic stand is made from cake tiers or plastic or cardboard cake boards. Another type of design, frequently called a cupcake tree, has individual rings to hold each cupcake in the stand. 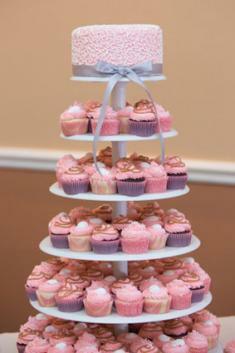 Tiered cupcake stands can have as many as six or seven levels, and they are particularly well suited for weddings. Each tier is flat, so the cupcakes can be arranged in different ways, and you don't have to fill the tiers completely. 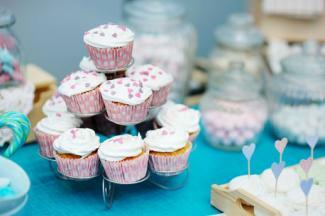 Most tiered cupcake stands are round, but some have square tiers. If you're looking for an eye-catching stand, check out those made of cardboard, many of which have bright colors and custom designs. To use a tiered stand, be aware of how many cupcakes the stand will hold. Overcrowding the stand with extra cupcakes won't look good and could overwhelm the stand and cause it to break or collapse. Bake and decorate your cupcakes ahead of time, and transport them and the stand separately. When you're ready to set up, place the cupcakes on each tier of the stand, starting with the bottom tier. Make sure to allow for some space between the cupcakes so that the frosting doesn't smudge and so it's easy for guests to take a single cupcake without disturbing the others. A cupcake tree is traditionally made of metal and has one individual holder for each cupcake. Many are more elegant looking than tiered stands, but cupcake trees hold an exact number of cupcakes and may look strange if you don't fill them up completely. To use a cupcake tree, bake, prepare, and decorate the cupcakes ahead of time. 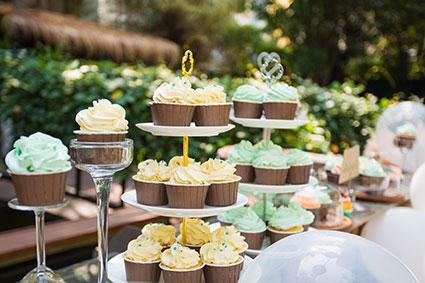 Even though the slots in a cupcake tree may seem more secure than the platforms on a cupcake stand, it's still a good idea to transport your decorated cupcakes and cupcake tree separately to the party destination. When you arrive, place each decorated cupcake in a slot on the tree. If you're interested in crafting or want to save money when hosting a wedding or a big event, you may want to try your hand at making your own cupcake stand. Since commercial cupcake stands or cupcake trees cost more than just a few dollars, making a simple stand can a large percentage of that price. Take out several brightly colored or decorated serving bowls. Make sure they are of varying sizes and heights. Flip them upside down on your counter or table. Add a flat patter or large dinner plate in a coordinating color or theme to the top. Center the cupcakes. Save a few sturdy cardboard boxes of varying heights. Place them on a small table and then cover with a tablecloth, pulling it so that the box sizes are visible. Place a glass or clear plastic platter on top of each box to hold the cupcakes. You may want to use some poster-hanging putty or other tacky item to affix the platters to the serving bowls and the boxes to the table. Do not use glue, as it can ruin finishes and is hard to remove. After choosing your stand and arranging the cupcakes, you should consider decorating the display itself. Additional decorations will enhance the theme and look of the cupcakes. Flowers are an excellent choice for decorating. Commonly found on wedding cake or anniversary cakes, they are also perfect additions to a cupcake display for a baby shower, birthday party or tea party. 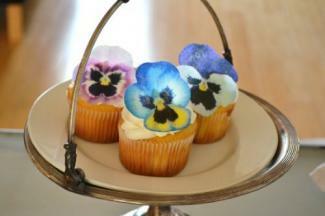 Place real or faux blooms every three to four cupcakes on the display. Add greenery, like leaves or even a garland, around the base of the cupcake stand(s). Some displays even have garlands and ribbons draped down the side of a stand and flowing onto the table. Animals: Display cupcakes with a farm animal theme using a child's barn or fence. Add accessories like a tractor and plastic hay bales throughout the display. For a jungle animal theme, look for small stuffed animals to place amongst the cupcakes, such as lions, monkeys or giraffes. 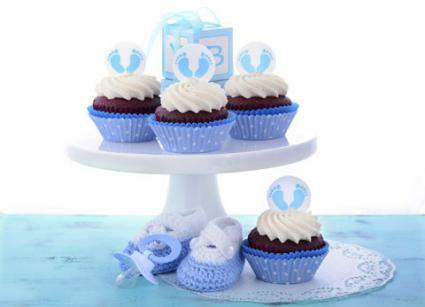 Baby Shower: At a baby shower, place useful items throughout the cupcake display. Pacifiers, small four-ounce bottles, rattles, bibs and baby shoes are perfect for adding a little something extra to the cupcake display. Use a baby blanket instead of a tablecloth underneath the displayed cupcakes. Luau: Tape leis around the edge of a tiered serving platter. Small coconuts and tiki centerpieces are also perfect for adding to the table around the cupcakes. Hunting: Decorate for a hunting theme by using shotgun shells scattered on the table around the cupcake stand. Place feathers or antlers around the table, too. Sports: Get into the game by decorating for a sports theme using favorite memorabilia. Small posters, photos and awards are perfect for placing around the cupcake display. Remember to add shoes, skates, or the game ball to the table as well. Interspersing a few tea light candles throughout the table will help create a sophisticated or romantic look to the cupcake display. This is a good idea for a dinner party or anniversary party display of cupcakes. During the holidays, use typical décor like Christmas ornaments or Easter eggs to the cake table. Just as there are many ways to decorate cupcakes, there are many ways to create a stunning display of the delicious goodies. Use a stand to create height and then decorate around the stand to bring your theme together.